When CS Beef Packers — a partnership between agribusiness giant J.R. Simplot Company and Caviness Beef Packers, a Texas-based company — opened a 700-job, state-of-the-art cattle-processing facility near Kuna, Idaho, in 2017, officials boasted of boosting the local economy. But to Mountain Home, 50 miles southeast of Kuna, that triumph looked more like a failure: CS Beef Packers had passed over Mountain Home after realizing the city didn’t have enough water to support the new plant. Like many Western communities, Mountain Home, a town of about 14,000 people in Elmore County, relies on groundwater to irrigate fields and supply homes with water. But the community’s needs — and agricultural irrigators, in particular — use more water than nature can replenish, and aquifer levels have been dropping for decades, drying up household wells. Local leaders have been pursuing additional sources of water for years. Now, that search has prompted a modern manifestation of an old Western practice: Having begun to exhaust the water within its own basin, thirsty Mountain Home is turning to a neighboring watershed. Elmore County, Idaho, hopes to pump up to 20,000 acre-feet per year from the South Fork of the Boise River (shown below) into a neighboring basin to help recharge its aquifer. Idaho, like most Western states, allows a city, irrigation company or other user to pump water up and over (or through) the ridge separating natural watersheds, a process called a trans-basin diversion. Such transfers have a long and fraught history, from Owens Lake in California, which the Los Angeles Water Board drained in the early 1900s to slake the thirst of the growing city 200 miles to the south, to Colorado’s dozens of diversions, most of which funnel water across the Continental Divide, from the wetter western side of the state to cities and farms in the arid east. In Elmore County, officials have applied to draw up to 20,000 acre-feet of water from the South Fork of the Boise River each year; for comparison, that’s enough water to supply about 40,000 households, though it wouldn’t go directly to municipal use. Instead, the county plans to pump it into a neighboring basin and let it seep down to recharge Mountain Home’s aquifer. 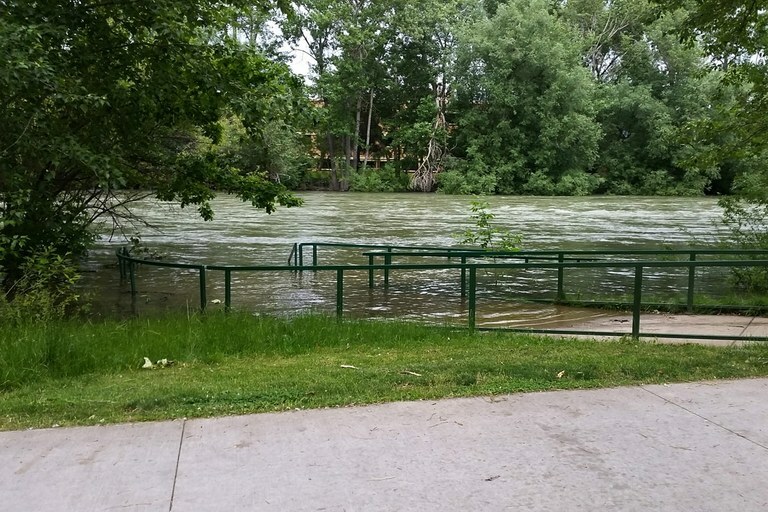 But because so much of the water in the Boise River Basin is already promised to other uses, Elmore County would only be allowed to operate its pumps when the river is flooding; most years, they could pump less than half what they’re asking for, and during dry years, they wouldn’t be able to pump at all. The Idaho Department of Water Resources is still considering Elmore County’s application. Late last year, the department convened a hearing on it, after the city of Boise, the Idaho Conservation League and a coalition of irrigators in the Boise Basin contested the claim. The objections range from environmental concerns to economic ones. The project is expected to cost about $32.6 million to build; because of that and other factors, Boise estimated, in opposing the application, that the price of an acre-foot of water — $304 — would be three times more than Elmore County farmers can afford to pay. That means the proposal may not be economically feasible, which is grounds for rejecting a water right application under the Department of Water Resource’s rules. Allowing Elmore County to divert water from the Boise River to replenish Mountain Home’s aquifer could also jeopardize the health of the South Fork of the Boise River and the fish that live there, the Idaho Conservation League argues. That would be counter to the public interest — another reason the department can deny a water right application. The hearing also raised an existential question looming over towns across the arid West: Should a community be forced to live within the constraints of its natural watershed? “You compare today’s world to Owens Valley, and we are in a different place in how we think about water,” Alex Maas, an economist at the University of Idaho who specializes in water issues, told me. “But in the end, there’s scarcity.” That means that eventually, the water will go to the highest bidder, Maas said, unless society decides to make an ethical argument to protect, for example, the fish that live in the South Fork of the Boise. Previous years of excess water in the Boise River, like this 2017 flood, led officials to suggest diverting water to Mountain Home. Mountain Home officials see recharging the aquifer with floodwater as a solution to the problem, not a perpetuation of it. If, in some years, there’s more water flowing down the Boise River than others are already using, why not let Elmore County boost its groundwater levels? “Mountain Home’s just trying to survive,” the mayor, Rich Sykes, told me. The city has also instituted water conservation measures, and begun replenishing its aquifer by diverting water into gravel pits north of town. 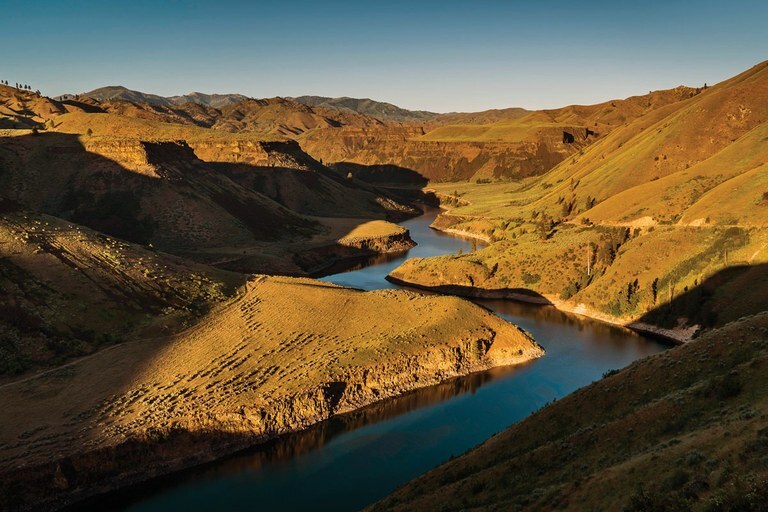 Sykes testified during the hearing that the Boise Basin seemed to be looking out for its own future water needs rather than its neighbors — after all, the Boise area is one of the fastest-growing regions in the nation. The Department of Water Resources is expected to make a decision by mid-March. It may deny the water right, or grant it, or issue it with conditions, such as requiring occasional high flows during flooding to keep sediment from clogging the gravel where fish spawn. 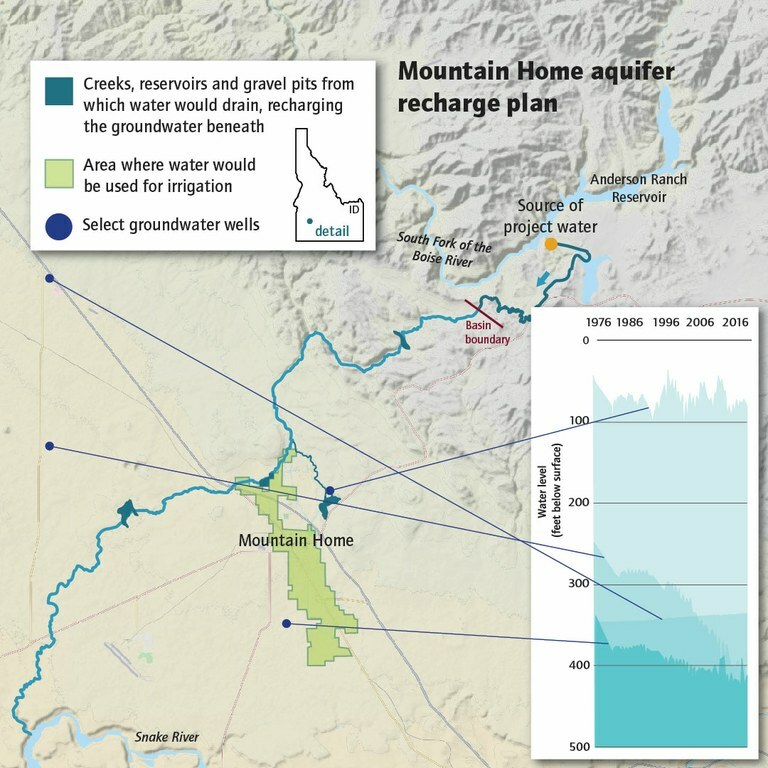 The aquifer recharge plan would replenish groundwater wells that have dropped in recent decades, and provide water for irrigation around Mountain Home. Emily Benson is an assistant editor at High Country News, covering the northwest, the northern Rockies and Alaska. Email her at [email protected] or submit a letter to the editor.